Back in July, I got an email from Lovin' Scoopful's PR company. You may have heard of them, they are the ones who donate 25% of post tax profits to charity. In particular, you may have seen Maria Shriver on the Colbert Report. Now for me, I start thinking Shriver > Special Olympics > Kennedys > east coast kinda thing, but Lovin' Scoopful is actually distributed out of Washington state. The good news is that since they started in 2008 they have slowly been working their way east. 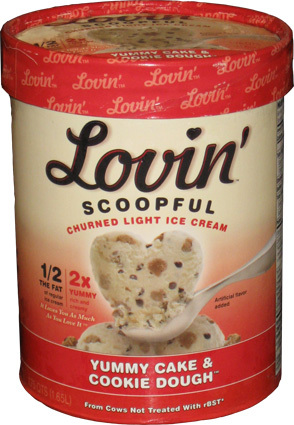 In late August, I got word that local Big Y grocery stores are now carrying Lovin' Scoopful. Good news for me as a couple of freebie coupons arrived in the mail shortly there after. So here is my first official foray into Loving Scoopful Ice Cream, Yummy Cake & Cookie Dough. 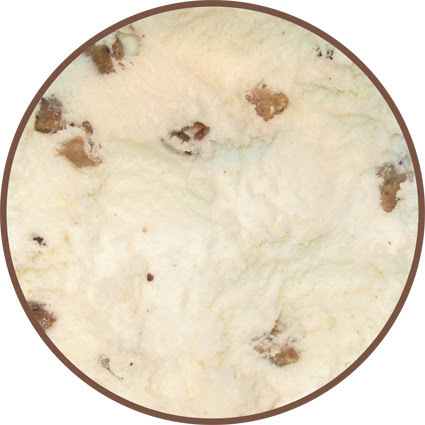 It's a cake flavored ice cream with "chunks" of chocolate and "heaps" of chocolate chip cookie dough. I don't think you've heard me mention Big Y before because it's not really a convenient store for me to hit on the way home. I have to go in the opposite direction, but I finally made it out today, so YAY for me! Well, at least that was my initial reaction. I walked into an older, yet spacious Big Y grocery store. I wasn't sure where to go, so I headed right and found the cold section. Funny thing was, I couldn't find the ice cream. Some frozen meals, some frozen veggies, and that's it. I starting heading back to the other end of the store past all the dry goods. I get to the other end and nope, this is the prepared food section. Ok, what did I miss? I head back to the cold side of the store (again) and start looking in the open refrigerators/freezers they have in the middle of the cold section. Wait, I see Ben & Jerry's! That's a start. The section is small then... and then I look over. Ahhh, one of the four open freezer banks is all ice cream treats. I didnt notice it before because the signs were perpendicular to the way I was walking (so basically I didnt even notice the signs... doesn't help that it's not real bright in this section of the store). Anyway, sorry, the point I want to start off with is "who puts ice cream in open freezers??" Ice cream is a delicate thing and it just seems wrong to have it exposed like this. Plus this isnt the worst part. The ice cream is stacked in two layers and whoever put it in wasn't even remotely careful. Half the lids arent even on anymore. You just barely touch them and they pop right off, and unlike the high end stuff, there is no seal on the L.S. containers (which I'm going to suggest they work on). Now there's a particular container on top that is just totally wrecked, and several more that arent much better. Wow, this is not cool. Lovin' Scoopful has about 40 containers out on display (say 4x5x2) and I'm having trouble finding a container that I'm sure is still sealed. This is not a good start, but I didnt come all this way to be denied. Oh, let me quick interject price here. A 1.75Qt container of LS was marked as $5.99 which does seem like a lot, but from what I can tell, everything in this store is crazy expensive. Those Klondike Oreos which i usually pick up for 2.50 or 2.99, well, they are $4.39 here!! I also picked up an over-sized rotisserie chicken for dinner, usually $7.99 at Market Basket, a whopping $13.49 at Big Y!! Can you guess the next time I'm going back to Big Y? That's right, never, good answer. So, back to the ice cream. I've got 2 free coupons and about a half dozen choices (officially there are 13 flavors but they are definitely not all here). Ok, I see Yummy Cake and Cookie Dough. Yeah, pick that one for my wife first. Hmmmm, what do I want as a second choice? So Good Cookies & Cream (with chocolate cows) or What the Fudge? C&C is hard to mess up, and those little cows look pretty cool. Ok, C&C it is. I grab some frozen veggies to use as cool packs and head for checkout. At home, we have our horribly overpriced chicken and then I ask what we should try first, cookie dough or cookies & cream. Cookie dough wins ofcourse! I doubt it's had time to fully refreeze, but off I go. First impressions? Honestly? Well, in the wrong light, those cookie dough bits look kinda green. Just look at the one that's farthest to the left. That's not poor photography (not completely anyway), it actually looks like that at first. This could definitely be Big Y's fault for not properly storing their ice cream, but I'm just not sure. Also, those aren't "chunks" of chocolate, those are mini chocolate chips. Chocolate is chocolate, but I like my containers labeled properly. Ok, I've dug further down and that's much better looking, thank goodness. Cookie dough bits look more brown and there are more of them now. I'm not sure where all the chocolate chips went. Notice the fluffy texture of the ice cream that's pretty typical of most specially churned ice creams. At 5% fat and 10% saturated fat, I knew this would be a light, fluffy, fast melting ice cream, but that's ok, I've been dieing to get something low fat in the freezer. So I scoop a couple of bowls and off we go. I take a quick whiff and sure enough there is a very faint aroma of cake batter. I go for a couple of cookie dough bits first and they seem fairly standard (if not a little strange looking). I've had better bits and I've had worse. The mini choco chips aren't doing a whole lot either. They are tiny and scattered. 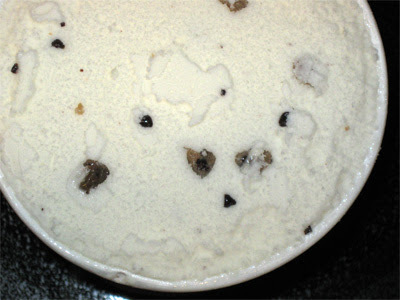 The downside to low fat is that chips are a huge source of fat, I just get frustrated when the picture on the container seems to be so far off from the actual ice cream (not that other companies don't do this). So we are digging into our bowls and I admit out loud that I'm not terribly impressed, and then my daughter chimes in. "All this ice cream does is melt" Wow, harsh words from my ice cream lovin' daughter. I should mention again that I'm not sure that the ice cream has had time to fully refreeze from the trip, let alone recover from it's unimpressive home at the grocery store. Maybe I should have waited 'til the next day before diving in. I'm feeling a little guilty because it sounds like I'm bashing a free ice cream that supports a good cause, but it is what it is. Overall, it's a decent light ice cream with flavors that are trying to be different. For whatever reason I thought it was cake bits, not a cake base. I'm not a huge fan of any cake base, but this one isn't super strong which I appreciate. I don't remember the chips affecting my tasting, but I'll make a point to look for them in the second scoop. I'm not a huge fan of the aftertaste, but I blame the cake batter flavor for that one. It's super low fat which is always good, there are times when a heavy ice cream is out of place, but it was so soft on our first scoop that it didn't fill any of us. So this will be the other point to look for on the second scoop. On Second Scoop: Well, the ice cream has refrozen and it tastes a little crunchy from the refreeze, poor ice cream. I'm really mad at Big Y for taking such poor care of their ice cream. Anyway, I just want to say this is a decent light ice cream that is trying to be different, I just don't love this flavor combo. I've tried the other flavor I bought, but it has suffered mightily at the hands of Big Y.
Dubba's Note: As of 5/3/2011, Big Y has announced they are closing this particular store. bummer. i just saw lovin scoopful on sale at walmart, but now i don't think i'll be pickin any up. unless the second flavor you got changes my mind.